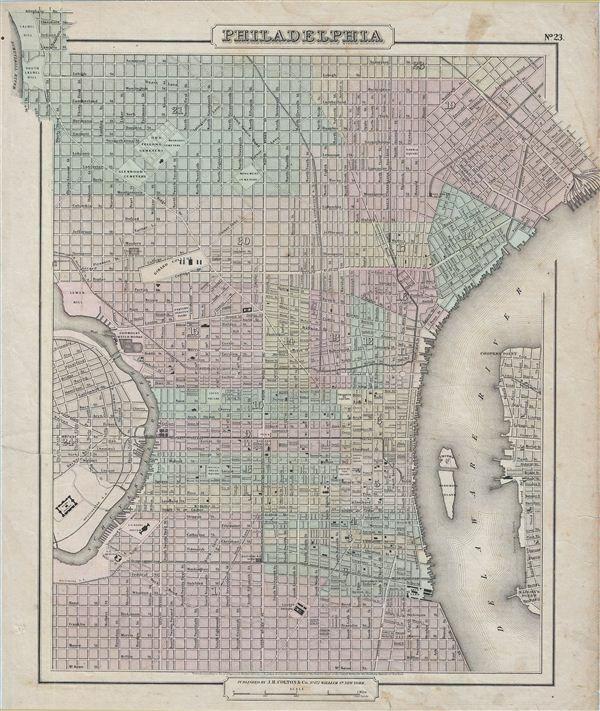 This is the uncommon 1857 issue of J. H. Colton's map or plan of Philadelphia. This scarce hand colored map is a lithographic plan covering the city of Philadelphia, divided into 24 districts or wards, between the western part of the Schuylkill River and the Delaware Rivers along with parts of Camden. Colored coded according to city wards, offers wonderful detail at the street level including references to the important buildings, cemeteries, roads, railroads and squares. Like most Colton maps this map is dated 1855, but most likely was issued in the 1857 issue of Colton's Atlas. This was the only issue of Colton's Atlas that appeared without his trademark grillwork border. Dated and copyrighted: 'entered according to the Act of Congress in the Year of 1855 by J. H. Colton & Co. in the Clerk's Office of the District Court of the United States for the Southern District of New York.' Published from Colton's 172 William Street Office in New York City, NY. Very good. Blank on verso. Minor stainging. Vero repair extending approximately 7 inches from left center margin to center of map and approximately 6 inches from center towards the top of the map.